The spacecraft first brought the probe Philae to a comet's surface -- now, in a thrilling conclusion, it's headed for the comet itself. The European Space Agency is bringing the Rosetta mission to a dramatic conclusion, sending the spacecraft toward a region of active pits at the “head” of the comet. The so-called “Ma’at” region is on the smaller of the two “lobes” on Comet 67P/Churyumov–Gerasimenko, and the area is home to pits that emit dust jets that are of interest to scienitsts. These pits have lumps on their walls that have been called “goosebumps,” and could be indicative of “cometesimals,” which helped create the comet at the beginning of our solar system. Rosetta will get up close and personal with these features at the end of September, targeting a point near a well-defined pit called Deir el-Medina, which could help scientists better understand the geological history of this area of the comet. 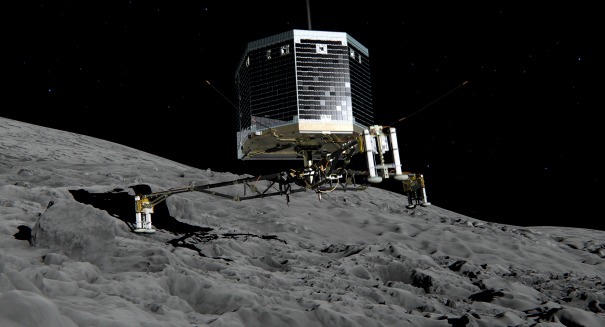 The Rosetta mission involved sending the probe Philae to the surface a couple years ago, which turned out to be successful, although the probe landed in a crevice that kept it from getting direct sunlight. Scientists managed to find the probe through pictures from Rosetta recently. “After months of work, with the focus and the evidence pointing more and more to this lander candidate, I’m very excited and thrilled that we finally have this all-important picture of Philae sitting in Abydos,” said ESA’s Laurence O’Rourke in a statement. O’Rourke had been coordinating the search efforts over the last months at ESA, with the OSIRIS and Lander Science Operations and Navigation Center (SONC, CNES) teams. “Now that the lander search is finished we feel ready for Rosetta’s landing, and look forward to capturing even closer images of Rosetta’s touchdown site,” added Holger Sierks, principal investigator of the OSIRIS camera.